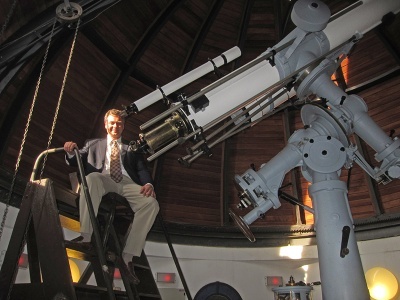 Scott in Uraguay in the Montevideo National High School Astronomical Observatory's Dome, with an 8-inch Zeiss Refractor that was installed in 1927. Scott Wayne Roberts (born 1959) is a supporter of outreach in astronomy and space exploration, and a popularizer of amateur astronomy. Since the early 1980s he has consulted, participated in, and engineered star party events and telescope viewings to a broad audience. He continues his work to build awareness and educate the public in astronomy. At the 2008 Astronomical League conference Scott Roberts announced his return to the telescope manufacturing industry as Founder of Explore Scientific, LLC. The company dedicated their sponsorship of the League's National Young Astronomer Award and the Leslie C. Peltier Award to John Diebel and Meade Instruments for their many years of support of the Astronomical League's outreach and recognition programs. Scott Roberts founded the AstronomyOutreach network in 2000 to popularize and support individuals and organizations committed to educational public outreach (EPO) in astronomy. In 2004, together with Dr. Mike Reynolds, Tippy D'Auria, and Terry Mann, serving on the Awards Committee, the organization launched the annual AstronomyOutreach Awards to recognize individuals and organizations that have produced exemplary and sustainable EPO programs in astronomy. In 2012, AstronomyOutreach network filed for its 501(c)3 non-profit educational organization status. In 2013, the organization launched its own digital publication Sky's Up, edited by Dr. David H. Levy, and in 2014, AstronomyOutreach network hosted the StarLight Festival. Each year AstronomyOutreach network donates astronomy gear to support sustainable EPO programs. One of the cornerstone alliances is with UNESCO where telescopes are donated to schools in developing countries. Beginning in 1986, Roberts worked with Meade Instruments, working in various capacities with the telescope maker, starting out as a Tech Support Representative and a Sales Manager. From 1992-98 Roberts worked for Meade in Asia setting quality standards for small telescopes and accessories manufactured in Taiwan. Over the years, Scott held official positions as Senior Technical Sales Manager, Director of Technical Sales, Vice president and National Sales Manager for the U.S.A. and Canada, and Vice President - Brand Community and Consumer Solutions. Throughout his long career at Meade, Scott supported the company in many areas including sales, off-shore supply chain quality management, e-commerce, web design, training, testing, Internet marketing, brand community marketing, trade show & community event management, and product design. Over the two decades he instructed the proper use of astronomical telescopes for people around the world. Roberts ended his career with Meade as Vice President - Global Client Support and Community Relations in 2008. From 1975 to 1986, Roberts worked in various capacities in what was originally known as Oceanside Photographic Center, including working in camera repair, custom darkroom work, sales, management, training, and marketing. In the early 1980's Scott became Manager of the company and introduced serious amateur-level telescopes into its product offering. Within a year he started conducting event marketing programs to popularize amateur astronomy. This led to the name change of the company to Oceanside Photo & Telescope (OPT), and establishing the Oceanside Photo & Telescope Astronomical Society (OPTAS), which became one of the largest amateur astronomy clubs in Southern California. Together with Craig Weatherwax (owner), and Mike West, they positioned OPT to become what is today, one of the leading retailers of high-end amateur astronomical equipment in the world. Roberts was inspired by John Diebel, the founder of Meade Instruments, and his commitment to support the astronomical community's organizations, events, and individuals who were committed to public outreach in astronomy. In 2005 with the endorsement of Meade CEO Steven G. Murdock, and Senior VP of Marketing Rich Jorgensen, he formed and launched the Meade 4m Community, an alliance of astronomy and space exploration organizations and enthusiasts, with members spanning the globe, with Scott serving as its Executive Director. 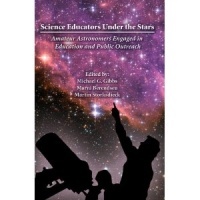 In 2007 Roberts contributed to the Astronomical society of the pacific's project "Science Educators Under the Stars" which resulted in a publication (ISBN 978-1-58381-315-7) edited by Michael G. Gibbs, Marni Berendsen, and Martin Storksdieck. One of the first publications devoted to education and public outreach in astronomy by amateurs, the book illuminates the need for awareness of astronomy and science in general. Other contributors included outreach activists Terry Mann, David H. Levy, Tim Slater, Daniel Zevin, Judy Koke, Dr. Mike D. Reynolds, as well as the editors themselves. In 2007, Roberts orchestrated the largest single donation of telescopes for public educational outreach in history, with large containers full of refractors and reflectors. Coordinated with Meade Instruments and Dr. Mike Reynolds, the telescopes were refurbished stock from Meade that were considered unsellable, and scheduled to be disposed of. Dr. Reynolds created a program to distribute and educate the recipients of each telescope that was donated. In the process, several thousand refurbished telescopes were saved and successfully re-purposed for educational outreach in astronomy. Roberts is an enthusiastic astronomer and astrophotographer. His most noted efforts in astrophotography were as part of the solar film crew with WGBH Boston's production of the NOVA (TV series) "Eclipse of the Century" that aired nationally on public television. During the July of 1991 total eclipse of the sun, Roberts ran three equatorial mounts with 35mm motion picture cameras mounted on them, simultaneously allowing the cameras to capture the "Diamond Ring" effect from the 14,000' summit of the Mauna Kea Observatory complex in Hawaii. The footage produced by the solar team directed by Boyd Estus (Academy Award-winning Director/Director of Photography noted for elegant work in 35mm, Super-16mm and 16mm film, and in video) revealed some of the highest resolution motion picture images ever made of a total solar eclipse. 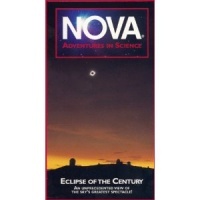 "Eclipse of the Century" was the winner of the 1992 American Association for the Advancement of Science Science Journalism Award. On July 4, 2005 the BBC's The sky at Night astronomy program presented by Sir Patrick Moore and Chris Lintott chronicled the impact of Comet 9p/Tempel by the Deep Impact (space mission) from Palomar Observatory. The program "Fallout from Deep Impact" documented the professional and amateur astronomers observations from Palomar, that included Roberts' interpretations as the small team of amateur astronomers visually and photographically observed the moment of the space probe's explosion on the comet's surface. In 2014, Roberts was one of the producers of the AstronomyOutreach network documentary, "BBSO Secrets of Our Star", filmed inside the New Jersey Institute of Technology's Big Bear Solar Observatory (BBSO) with host Dr. Stephen J. Edberg. "BBSO Secrets of Our Star" was produced to explain the history and current research that is conducted at BBSO, and will be used as part of BBSO/NJIT's public outreach programs. The short documentary is in post-production (release scheduled for May 2014). On November 16, 2000 Carolyn S. Shoemaker and David H. Levy named an asteroid 15779 scottroberts = 1993 OA3, in honor of Roberts. The minor planet was discovered July 26, 1993 by Carolyn and David at Palomar Observatory with the 18-inch Schmidt Camera. The certificate inscription reads: Named in honor of Scott Roberts (b. 1959), who for many years has encouraged amateur astronomers to pursue their love of the night sky, spending much time teaching people how to use and enjoy their telescopes. In May 2001, Roberts received the Clifford W. Holmes Award during the 32nd Annual RTMC Astronomy Expo. In 2001 and 2002, Scott Roberts received The International Dark-sky Association, Executive Director's Award, "In recognition of enthusiastic efforts in the pursuit of the promotion of Dark Skies". In 2004 Roberts was accepted into the Solar System Ambassadors Program, a public outreach program to inform the public about the space exploration, discoveries, and missions of the Jet Propulsion Laboratory and NASA. Managed by Kay Ferrari, the Solar System Ambassadors Program is headquartered at JPL in Pasadena, California. In July 2008, Scott W. Roberts was presented the Astronomical League Special Award, "In grateful appreciation for his outstanding dedication to the amateur astronomy community". At the 2011 RTMC Astronomy Expo, Roberts was honored with the G. Bruce Blair Medal for astronomy outreach. Roberts has served on the board of directors of the Astronomical Society of the Pacific, and the International Dark-Sky Association. He currently serves on the boards of the National Sharing the Sky Foundation and Astronomers Without Borders.